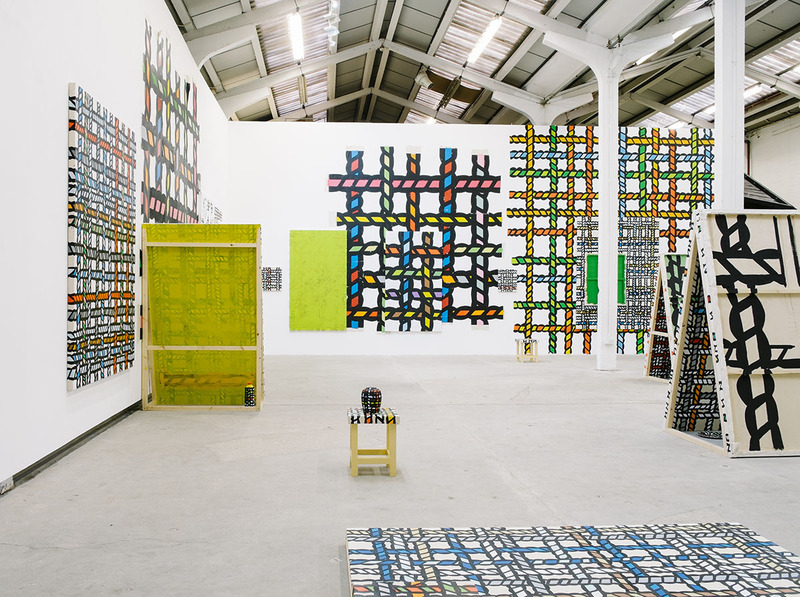 Eastside Projects is a contemporary art gallery which was opened in 2008 with the aim to “make art public” and support the cultural growth of Birmingham. The artist-run space, which is a converted warehouse nestled amongst the various auto repair garages on Heath Mill Lane, is unique in the sense that it views the gallery itself as an artwork, with many works “remaining” over a long period of time, allowing it to be responded to and evolve. 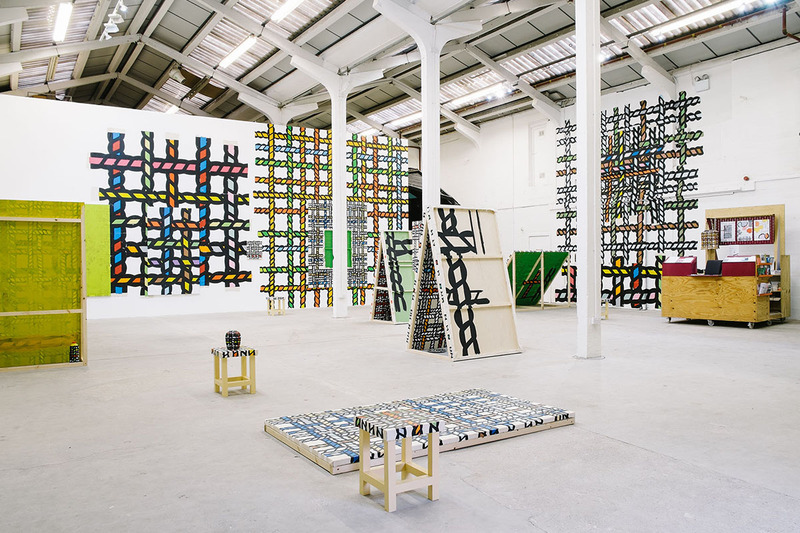 “Duck Weave”, which is presented here as the early findings of Richard Woods’ research into a mysterious local weaving practice, is the first show by the internationally renowned artist in which he has painted on canvas. The decision to use canvas had a strong bearing on the outcome of the show as a whole, as clarified by Woods; “I’m really pleased with the outcome of the imagery used in the show, as it came from quite an organic process, starting with my interest in using canvas as a material, and then deciding the paint an almost ‘microscopic’ version of the canvas back onto itself”. The Cheshire born artist, who sees himself as “someone looking into the world of art, design and architecture, who loves making stuff”, is known for applying a playful cartoon-like finish to real life surfaces in a variety of circumstances, from public art projects at New York City Hall to store interiors and exhibitions for fashion labels such as Comme Des Garcons and Paul Smith. Fans of Grand Designs may wish to check out Woods’ own home, the recently built “WoodBlock House” in Hackney, a collaborative living space project with London design studio, dRMM, complete with his signature “wood grain” stairs. In this exhibition, Woods invites the audience to consider the practicalities of weaving as a construction technique in everyday life, whilst simultaneously questioning the conventional approaches that surround scale. He does so by applying his multicolored, overlapping Duck Weave “logo”, in the form of acrylic paint and pasted paper to nearly everything in the space. 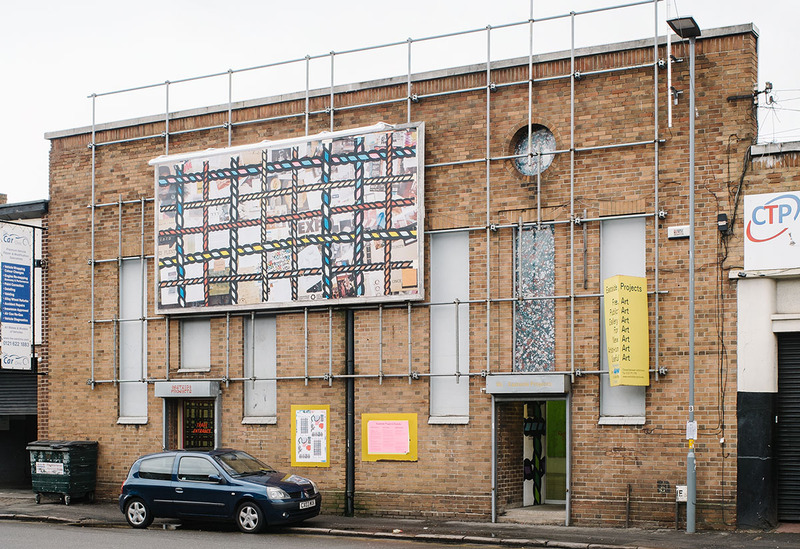 From 20 metre long gallery wall paintings (Duck Weave JJ 2016), to canvas topped stools (Duck Weave GJ 2016 (Stool)), even the existing Stuart Whipps 48 sheet billboard outside the building (Duck Weave LM 2016) is not left untouched. Woods’ also travels back along the timeline of this ‘skill based construction technique’, investigating its use in history as a basis of community or family, represented by the freestanding canvas sculptures in the middle of the show, which resemble shelter like housing, and contain objects such as plates and vases. The 27 different works in the show are all named “Duck Weave” followed by the initials of various people who have worked on the project with Woods and the artist has applied same repeated approach to the work displayed with great effect. Woods believes that his sharp use of colour allows him to “take something real and shift it into a synthetic world.” The results are a vivid, colourful feast for the eyes, which invites you in to explore further into its beginnings as soon you enter the space. 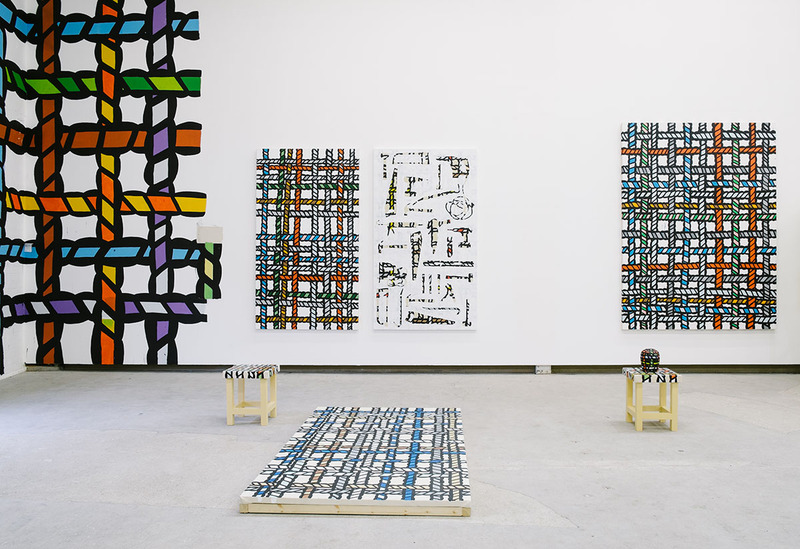 Duck Weave at Eastside Projects is open to the public, every Wednesday to Saturday, 12-5pm from now until the 9th April 2016. To learn more about the gallery, check out the website http://eastsideprojects.org/ or follow them on Twitter.